In a popular YouTube video, the beaming little ballerina dances an entire four-minute routine seemingly perfectly, matching the steps of the professional Australian ballet dancer whose image is seen in the video's lower corner. They both raise and lower their arms in the style of a lifesize dancing doll, whirling and turning in accordance with the steps of the 19th century comic ballet, "Coppelia." 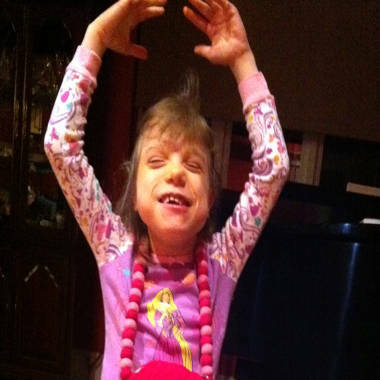 It would be an impressive achievement for any 10-year-old girl, but the viral video stunned the Internet in part because 10-year-old Clara Bergs is autistic and also has DiGeorge syndrome, a genetic disorder that often affects development. Her mother, Lisa Anderson of Toronto, told TODAY that Clara spent almost the entire first 16 months of her life in the hospital. She walked at age 5, spoke at 6, breathed through a tracheostomy until she was 6 and still relies on a gastrostomy tube for nourishment. But she was always determined to fight through her challenges. "We knew that she no longer needed her trach when she kept pulling it out and throwing it away in the park, on the sidewalk, in the lake," Anderson told TODAY. Clara has been taking ballet lessons for three years, her mother says, and has also studied piano. She comes by her artistic interests naturally -- Anderson studied piano performance and Clara's father, Roger, is a composer, music director and composition teacher. Still, no one expected her to have so completely mastered the complex dance. "We knew Clara would dance and practice this ballet but we never knew how precise her movements were until one of Clara's therapists, Marielle Yap, decided to videotape her and compared it to the original performed by the Australian Ballet, which is the version Clara usually watched.," Anderson said. "We were all completely shocked and amazed!" Anderson has high praise for the Intensive Multi-Treatment Intervention program, founded by Jonathan Alderson, who works with Clara and her family. A group of others, mostly college students, also have been trained to work with Clara, and "have become like an extended family to us," Anderson said. "THe IMTI program is customized for each child and brings in all sorts of treatments (and) therapies the specific child may need," she told TODAY. "So, for example, with Clara, due to her weaknesses, we have done lots of gross motor and self-help skills, vision therapy due to low muscle tone, yoga, eating by mouth, speech therapy, osteopathy due to scoliosis etc. Jonathan has a gift of being able to observe a child and determine what that child needs at that time." Clara's family has always been able to pay for about half of the cost, but recently lost funding for the rest of it. And because the Canadian government will not cover the costs of the IMTI program, the family turned to more creative means, including publicizing the video, to raise money. Interested people can donate to Clara via PayPal and also follow her on Tumblr and Facebook. "We've been overwhelmed by the attention this video has received," Anderson told TODAY. "We've received so many lovely comments from people all around the world who have been inspired by Clara." Clara still dances every day, her mother says, and in addition to ballet, she also enjoys jazz and contemporary music, including her fellow YouTube hit, "Gangnam Style." "It makes me want to go back to the doctors who basically said there was no hope for her and show them just how much inspiration this little girl has given so many others," Anderson told TODAY. Does Clara's ballet inspire you? Tell us on Facebook.